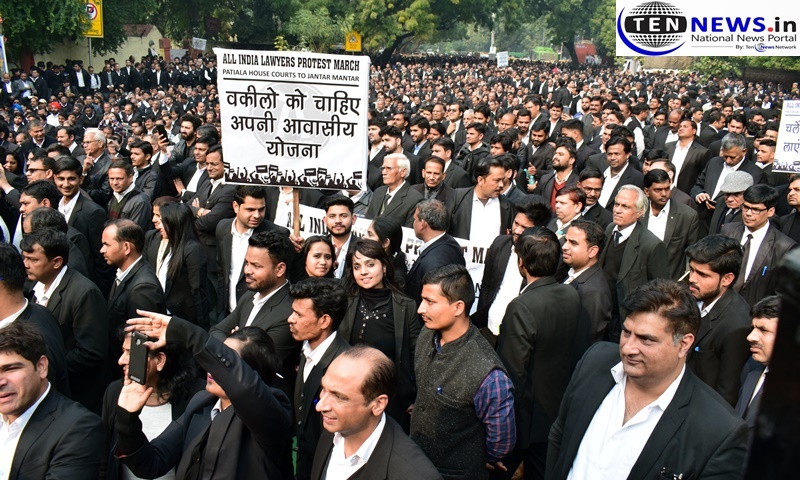 New Delhi : Lawyers in Delhi took part in a protest march from Patiala House Court to Jantar Mantar on Tuesday demanding budgetary allocations for the welfare of advocates. The office bearers of the Bar Council of India, Bar Council of Delhi, Supreme Court Bar Association and Delhi High Court Bar Association, among others, participated in the protest march. Lawyers from all over the country were present at the strike to press for their demand for allocation of Rs 5,000 crore in the Union budget for the welfare of advocates. The Bar Council of India (BCI) called for the strike in association with the state bar councils and representatives of the various high court bar association. Lawyers held Ramlila on the premises of high courts and near governor houses across the country to voice their concerns. “The legal fraternity is urging the Union government to provide budgetary allocations at all-India level.” said Bar Council of Delhi chairman KC Mittal. Earlier on Monday, a group of 30 lawyers, along with the president and vice-president of Supreme Court Bar Association, met law minister Ravi Shankar Prasad. “The minister assured that he has already started working on the demands made by the lawyers,” said a lawyer, who was among those who met the law minister.